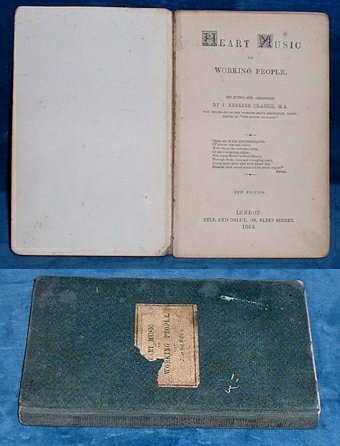 Title: HEART MUSIC for Working People selected and arranged by J.Erskine Clarke, M.A. Hon.Sec. of the Working Men's Association, Derby; Editor of the Parish Magazine. Description: London, Bell and Daldy New Edition 1863 Decorated initial capital to each poem. . Small octavo green pebbled cloth with printed label to cover (label lacks upper corner/tips of cloth worn) viii +134pp index under subjects eg. Street-walk, Country, Work-house, Rest-day etc. A few stray pencil marks and a few corners turned down so obviously read with a few signs of use. An interesting collection of what was deemed "suitable" for the working class's self improvement by a well known editor. He founded The Chatterbox edited the Children's Prize and wrote "Plain Papers on the Social Economy of the People" among other books for young and old. This title not common.